A number of factors affect healthy nail growth. While an adult’s fingernails grow an average 1/10 inch per month, children’s fingernails grow faster than adult nails and the growth rate decreases as you age. Other factors that affect nail growth include malnutrition, poor circulation and limb paralysis, as well as the effects of chemotherapy. You can promote healthy nail growth by taking care of your nails. Nail growth starts in the base of the nail under the cuticle in the part that looks like a white half moon. 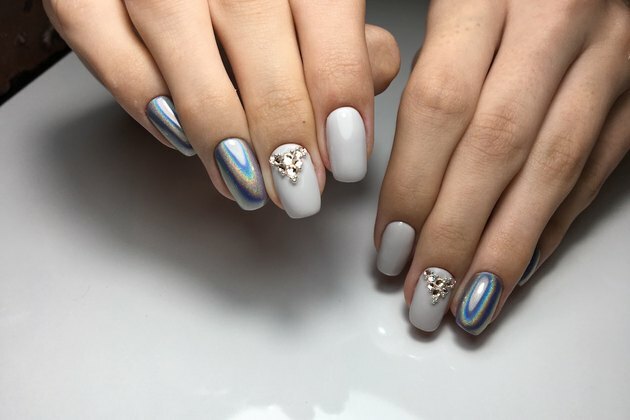 This area is called the nail matrix, or nail bed, and consists of a group of specialized cells that produce the protein keratin. The new cells push older cells upward and the keratin in the older cells hardens into the compact layers that form the nail plate, the hard part of your fingernail. Protect your nails to keep them healthy and strong. Don’t bite your nails or pick at your cuticles; these habits may damage the nail bed or lead to infection. Pulling at hangnails is another potential source of infection that can be avoided by clipping the hangnail at a slight outward angle. Find an appropriate tool when you need to pry or pick at something. Using your nails as a tool may cause nail damage. Healthy nails need moisture. Your nails may become dehydrated through frequent hand washing and drying, exposure to cleaning products and solvents like polish remover, cold and dry weather conditions and normal aging. Help prevent nail dehydration by moisturizing your hands and nails after you wash them and at bedtime, avoiding long hot baths and showers, using sunblock to avoid sunburn on your hands and wearing gloves when you go outside in cold, dry weather. Reduce the likelihood of split nails by taking the time to soak your nails before you trim them. Trim them after taking a bath or shower. Use a fine file or emery board to file your nails in one direction. If a manicurist cares for your nails, avoid infection by verifying that the tools have been properly sterilized. Do not have the manicurist remove your cuticles, as this can also lead to infection. Dietary changes, multivitamins and gelatin supplements will generally not help your nails, though dietary supplements may improve nail growth in those who are actually malnourished. Evidence suggests, however, that supplements of the B vitamin biotin may be helpful in reducing splitting and increasing the thickness of brittle nails. Tell your doctor if you notice changes like yellow discoloration, pitting or curled nails because such changes may be signs of an underlying health problem. Harvard Medical School: Does Having Ridged and Split Fingernails Mean I’m Unhealthy?